Tran, A.T., Kolczak, U., La Mar, G.N. Temperature 303 (±1) K, Details Human Hb A was isolated and purified from human blood, and subunit separation were carried out following standard procedures. Cyanomet complexes were prepared by oxidizing the the oxyhemoglobin with potassium ferricyanide, followed by chromatography. 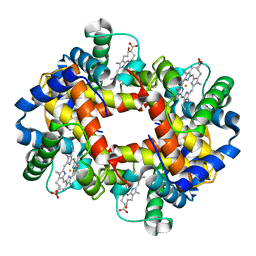 State isotropic, Details Human Hb A was isolated and purified from human blood, and subunit separation were carried out following standard procedures. Cyanomet complexes were prepared by oxidizing the the oxyhemoglobin with potassium ferricyanide, followed by chromatography.